It's the end of an era! The vet will be here soon to 'de-jack' our beloved Donkey Doodle Dandy, as well as young Gus and Gnat. It seems that somebody around here thinks a herd of seven longears is plenty, and that this whole baby donkey business needs to stop. I'll certainly miss having adorable baby donkeys around each year (although there's a slight chance, ahem, Evie might be pregnant), but it'll be great to be able to let Dan go back to running with his people rather than with the sheep. The farrier is coming this afternoon, too. He'll help hold Dan completely still while the vet puts the shot of sedative in his neck, and he'll also give Dan a much needed pedicure—probably while he's still sedated. 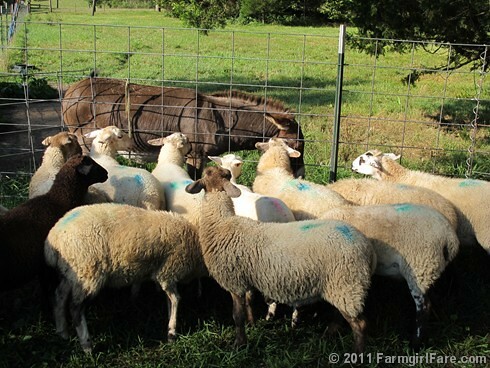 I'm a little worried (okay, a lot worried) about all this, especially since dear Dan is 10 years old (you can read about how Dan joined the farm family in The Tail of A Donkey and His Ratty Blue Halter). Cross your hooves that all goes well. In the meantime, I can't believe I blew it. I should have saved this photo for today's announcement! © FarmgirlFare.com, where I've found that it's always a good idea to hand out bribes treats to the hired help, so I have two bags of giant oatmeal raisin cookies and a couple of big hunks of old-fashioned banana cake with cream cheese frosting ready to go. I find bribing the help to be an excellent technique. For one thing, they always wanna come back and for another, they do better work! An oatmeal cookies with tons of raisins sound awesome. I fell in love with Donkey Doodle Dandy the other day when you posted the picture of him with his tongue hanging out! Loved that! Sorry to hear he's going under the knife, so to speak. Guess it's time to control the donkey population. I loved your comment that Dan gets to go back to 'running with his people'! We will always love the donkeys! There is always the unpleasant side of having livestock but the rewards outweigh them in the end and triple D will soon be a happy camper again. Cute cute CUTE photo. What are the blue marks on their backs? Awww Dan, wishing you a speedy recovery. All the best to Dan and his anxious Mama. YOu are too cute. But wait a minute - what was this about old fashioned banana cake? Have you been holding out on us? That sounds dee-vine. Please share! This photo is so cute! I'm keeping my fingers crossed for Dan and also for you. The cookies and cake sounds fantastic for the hired help. I would enjoy a good banana cake recipe. If you find the time could you share it? I'd really appreciate it.